Canare L-2E5 is an extremely flexible miniature version of Canare L-2T2S, perfect when small size and light weight is a consideration. Designed and perfect for patch cables, hidden lavaliere microphones or any balanced audio installation. Shield: >96.7% Copper TAC Braid. 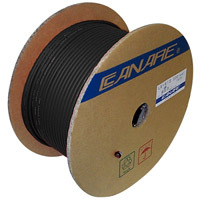 Conductor DC Resistance: <38.7 ohms/1000 ft.
Shield DC Resistance: <6.7 ohms/1000 ft.